Raspberries are one of my favorite summer treats. My bushes are full! 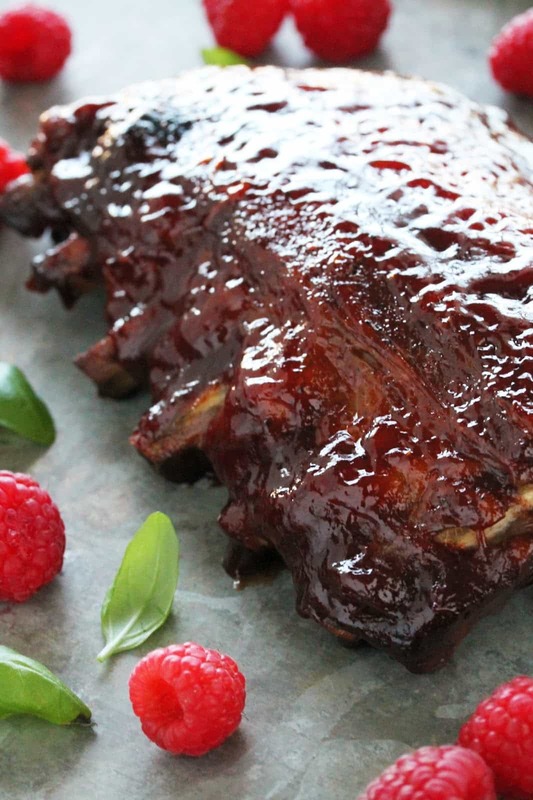 Combine raspberries with baby back ribs and you’ve got yourself a killer summer meal. 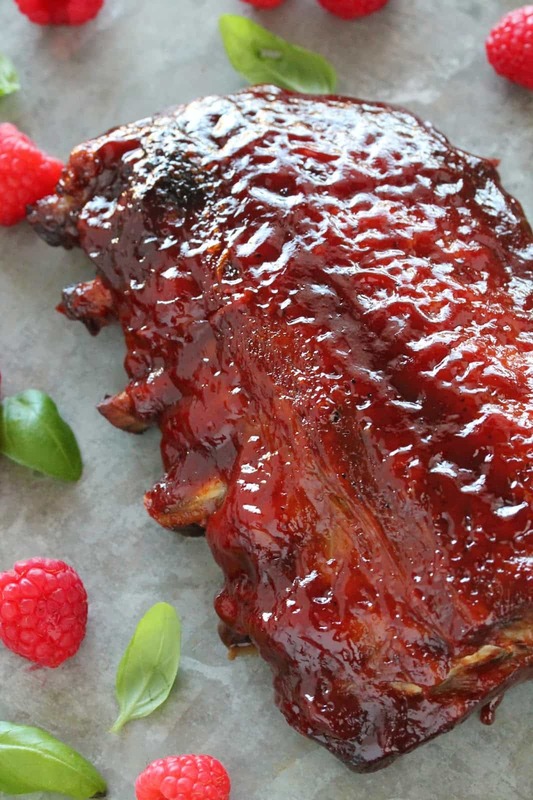 A homemade raspberry-chipotle sauce is brushed on meaty, tender baby back ribs. It’s all cooked up in the slow cooker so it couldn’t be easier. I’ve written about the secret to crockpot ribs before, and include my secret in this recipe. Seriously, these ribs will fall off the stinkin bone which will allow you to shove them in your gluttonous face even faster. You’re welcome. It’s time to enjoy yourself a little before all this summer goodness goes away! 1. In a large saucepan over medium-high heat, heat olive oil. Add in sweet onion and saute for about 5 minutes. Add in garlic and saute for another 60 seconds. Stir in raspberries, basil, chipotle chiles, ketchup, brown sugar, Worcestershire sauce, ground mustard, and pepper. Increase heat to high and bring to a boil. Reduce heat to medium-low and simmer for 10 minutes. 2. Transfer sauce to a blender or food processor and blend until smooth. Divide sauce in half and set aside one half in the refrigerator to be used at serving time. 3. Cut rib racks in half. Layer ribs in a crockpot, pouring a little of the remaining sauce over each layer. 4. Cover and cook on low 8 hours. 5. Before serving, lay the racks on an aluminum foil-lined baking sheet. Brush generously with reserved sauce. Broil under a broiler until sauce begins to bubble and caramelize. Serve hot. A quick update on the Roasted Raspberry Chipotle Sauce: I buy it at Costco. 40 oz bottle by Fischer & Wieser. Just leave it in the fridge for months–and use it to season everything from cottage cheese to ribs. They also make a mango sauce I haven’t tried. Go for it! I combined this with BBQ sauce and brushed on each layer; saved a little for the top. Now I have to wait the 8-10 hours for this wonder to cook! Enjoy! Thanks for the inspiration! I just made my own tweaked version with a bunch of frozen wildberries that i had plus some strawberry fig balsamic reduction and OMG the house smelks amazing with the ribs in the Slow cooker smothered in that bbq sauce! Yum yum yum. Is it possible to add the sauce and ribs together and freeze for future use? Can i cook in slow cooker from frozen? New to making ribs!! Could you use a pork tenderlion instead of ribs? I’m sure it’s worth a try! I made these with beef ribs overnight. They came out amazingly. Unfortunately most of them didn’t last to get into the oven. The marinade was very time consuming and I used my immersion blender to make it smooth. I put most of the marinade in the slow cooker pot and then let it sit in the refrigerator for a few hours before putting it in the slow cooker. I think I’m going to reuse the rest of the marinade for something else. Hi I’m going to double the recipe and slow cook in the oven. What temp and cooking time would u suggest, thanks. 250 degrees for 3 hours should get you close. Yes, you can still use the sauce. I’d use the dry rub without the sugar if you’re going to add the sauce also! It depends on how big your slow cooker is. It’s difficult to fit 4 racks into a slow cooker. Do you cut the ribs before or after you cook them? Hahaha, good catch! I wish I had an editor…. hello, other people have said to cook the ribs first than drain and add sauce and cook the last hour so it isn’t runny? is this true? I do not drain the ribs. I do reserve some of the sauce to brush on top before serving. 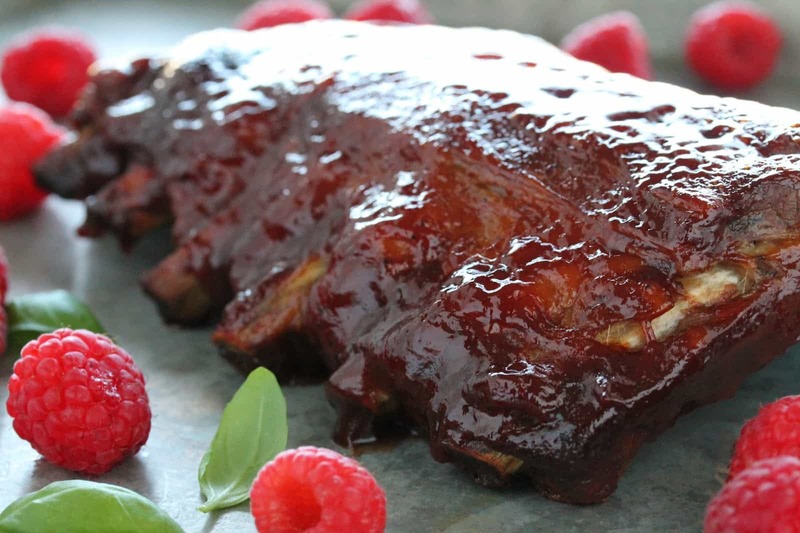 Could you make the sauce the night before and use in the morning or is it better to make right before putting ribs in the crock pot? Yes, you can totally make it the night before.